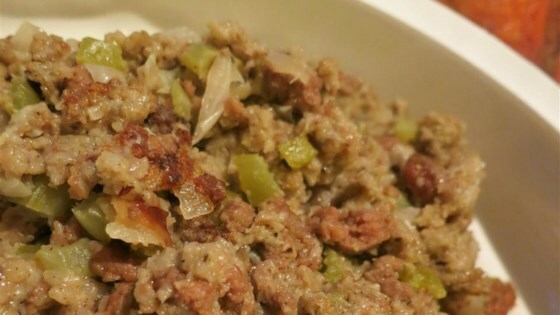 "This is my mother-in-law's recipe for traditional bread stuffing. Bread, pork and seasonings blend to create a perfect filling for the holiday bird. Use more bread if needed to create a stuffing that's moist, but not mushy." Mix together the sausage, celery, onions, bread, sage, salt and pepper in a large bowl. Pour the eggs and chicken broth into the mixture. Use more broth if needed. The stuffing should be moist, not mushy. This is good, but only because I added a bunch of seasonings and more chicken broth. As the recipe is would NOT be good at all. I've tried alot of stuffing recipes and this one absolutely blows them all out of the water. Fantastic!